There is a new No. 1, but probably not a consensus. The debate over Gonzaga vs. Kansas is legitimate. The Zags beat the previous No. 1 Duke on a neutral court in Maui. Gonzaga was/is a man-down with Killian Tillie out for the foreseeable future. The Zags were the dominant team for most of the game. It was as impressive a win as we’ve seen so far this season. Kansas has knocked off Michigan State, winners of the Las Vegas Invitational last week over UCLA and Texas, and held off Tennessee — a legitimate SEC title contender after sharing the championship last season — in overtime. I went with the Zags. This spot could be a rotation of a handful of teams over the next few weeks, especially with Gonzaga playing Tennessee in Phoenix on Dec. 8 and at North Carolina on Dec. 15. Win both and the Zags could be No. 1 for the rest of the season. Onto the Power 36 and likely a debate! 1. Gonzaga (last week 3): The Zags’ stars Zach Norvell and Rui Hachimura were sensational in the Maui Invitational title. This has to go down as one of Mark Few’s most memorable in-season tournament titles in an illustrious career. A road game at Creighton Saturday just got harder with the Bluejays win over Clemson. 2. Kansas (2): The Jayhawks get jumped by the Zags by virtue of who they beat comparatively (for me). But Kansas had a great week by all standards with the NIT Season Tip-Off title with wins over Marquette and Tennessee at Madison Square Garden. 3. Virginia (4): The Cavaliers stifled Wisconsin down the stretch and held on for a Battle 4 Atlantis title in the Bahamas. Virginia held Wisconsin to just 46 points. No one has scored over 60 against the Cavs this season. And De’Andre Hunter has led the Cavaliers in scoring in the past four games (I will keep mentioning that he didn’t play in the loss to UMBC). A road game to rival Maryland looms large this week in the ACC-Big Ten Challenge. 4. Duke (1): The Blue Devils made a strong comeback against Gonzaga but fell short by two. The lack of veteran leadership in the backcourt could be an issue at times this season. The next difficult road game could be at Florida State on Jan. 12, which means Duke has time to figure it out. Indiana is up next in the ACC-Big Ten Challenge. 5. Michigan (5): The Wolverines continue to lock teams down defensively, limiting the last two opponents to under 56 points. Michigan has given up more than 55 points only once — 61 to George Washington. Michigan hosts North Carolina this week in the ACC-Big Ten Challenge. 6. Michigan State (9): The Spartans are still looking for that middle-ground game. They have looked poor in two halves — the first against Kansas and the first against Texas. But they have looked sensational in the second halves in both of those games. Michigan State was dominant in the win over UCLA and then took down Texas in the second half to win the Las Vegas Invitational. Josh Langford scored zero in the first half but then torched Texas for 29 in the second. Road games at Louisville (ACC-Big Ten Challenge) and at Rutgers (Big Ten opener) await. 7. Tennessee (8): The Vols could have shot up into the top four if they had taken down Kansas at MSG. But alas they couldn’t close out, and lost in overtime. Tennessee has the goods to be a Final Four team. The Vols also have the chip after the upset loss to Loyola-Chicago in the second round last NCAA tournament. The Gonzaga game on Dec. 8 will be another barometer to see where the Vols stand. 8. Nevada (10): I got a chance to watch the Wolf Pack up close in Las Vegas. Jordan Caroline is a stud and the team’s most important player. Jazz Johnson is the team’s energy off the bench and will end up being one of the most critical pieces toward a Final Four run. The wins over Tulsa and UMass were cemented with impressive second-half closeouts. Nevada goes to Loyola-Chicago for a rematch of the Sweet 16 game Tuesday and then takes on struggling Southern California in Los Angeles Saturday. 9. Auburn (7): The Tigers got out of Maui 2-1 after beating Xavier in overtime, losing to Duke and then pulling away from Arizona. The defensive shutdown of the Wildcats should be a good springboard for Auburn over the next few weeks. 10. Texas (25): The Longhorns were as impressive as any other top-10 team in the win over North Carolina and then in the first half against Michigan State. Texas is long in the post and has a dynamite scoring guard in Kerwin Roach II. He lit up the Tar Heels for 32. Texas ran out of gas in the second half and didn’t defend the perimeter as well against the Spartans. But Shaka Smart has his crew ready to roll in the Big 12. 11. North Carolina (5): This drop may not be fair but the play of other teams forced them to move down a few spots. The Tar Heels have a new star in Coby White, who scored 33 in the loss to Texas. Nassir Little will shine soon enough. The veterans of Luke Maye, Cam Johnson and Kenny Williams are proving to be a steadying influence. The Tar Heels’ brutal slate continue at Michigan this week in the ACC-Big Ten Challenge. 12. Kentucky (12): I’m holding Kentucky steady here in the top dozen. Keldon Johnson is busting out and Reid Travis is boarding. All things are heading in the right direction since the Duke debacle. We’ll learn a lot more about this squad later in December against North Carolina in Chicago and at rival Louisville. 13. Kansas State (13): The Wildcats won the Paradise Jam over former rival Missouri earlier in the week and then dispatched Lehigh to end the week. Dean Wade is back to being the leading scorer. A road game at Marquette this weekend will be another barometer for the Wildcats. 14. Buffalo (15): The Bulls continue to plow ahead and are off to the Belfast Basketball Classic. A potential matchup against San Francisco — assuming Buffalo beats Milwaukee — will provide a decent test on a neutral court. 15. Iowa (17): The Hawkeyes moved up with other teams dropping. But Iowa’s tests will come fast and furious this week. They should beat Pitt in the ACC-Big Ten Challenge and then host hot Wisconsin and travel to Michigan State this weekend in the first games of the Big Ten season. OTHER: Zion vs. RJ Barrett: Who's the more impactful Duke freshman? 16. Ohio State (19): The Buckeyes defense continues to impress, holding Samford to 50 and Cleveland State to 62. Playing Syracuse in the ACC-Big Ten Challenge and then hosting Minnesota to start the Big Ten will give the Buckeyes two major tests this week. 17. Virginia Tech (20): The Hokies followed up the Charleston Classic title over Purdue by holding NEC favorite St. Francis (Pa.) to just 37 points in a rout. Penn State is next on the road in the ACC-Big Ten Challenge. 18. Wisconsin (24): The Badgers had an impressive week in the Bahamas, even though they didn’t win the event. Ethan Happ, D’Mitrik Trice, Kobe King and Nate Reuvers all made significant contributions in wins over Stanford and Oklahoma. Virginia’s defense stifled all but Happ, who had 22, in the final. Wisconsin will host NC State in the ACC-Big Ten Challenge before the Big Ten season opens at Iowa. 19. Iowa State (22): The Cyclones were a stand out team in Maui, even though they got upset in the first game against Arizona. Still playing without its best player Lindell Wigginton, Iowa State beat Illinois and San Diego State handily. Marial Shayok and Talen Horton-Tucker are holding strong in Wigginton’s absence. This team will be a top-three Big-12 challenger once it’s whole. 20. Minnesota (30): The Gophers beat Santa Clara and then Washington in the final seconds in Vancouver. Jordan Murphy was Jordan Murphy with his usual double-double. But the best news was Gabe Kalscheur hitting the 3-pointer to beat the Huskies. Kalscheur is part of a freshmen class for the Gophers that has star written all over it (see: Daniel Oturu). The Gophers open the ACC-Big Ten Challenge at Boston College Monday and then play Oklahoma State in the home of the Final Four at U.S. Bank Stadium Friday before opening the Big Ten Sunday at Ohio State. 21. Texas Tech (NR): Yes, Red Raider fans Texas Tech is better than predicted. And I’m ready to update my preseason predictions. I do think if this Red Raider team continues on this path they can be back in the NCAAs. The win over Nebraska in Kansas City was dominant. Jarrett Culver is on quite a tear, leading the team in scoring in four straight games, including 26 against the Huskers. The Red Raiders get Memphis next. 22. Villanova (NR): The Wildcats have climbed back into the Power 36 with the title at the Advocare Invitational in Orlando. The win over Florida State was a defensive battle, but Nova prevailed. The losses to Michigan and Furman won’t be forgotten or ignored, but Nova is making the climb back up and should continue this week with the first Big Five game at La Salle. 23. Florida State (11): The Seminoles took a tumble after squeaking past LSU in overtime and losing to Nova. Maybe this is too far a fall, but let’s see how the Seminoles handle Purdue this week in the ACC-Big Ten Challenge. I’m still high on this squad as a possible top five finisher in the ACC. 24. Purdue (21): The Boilermakers came back from the Charleston loss to keep Robert Morris to 46 points. The Boilermakers defense will need to be tight again with four monster games upcoming at Florida State in the ACC-Big Ten Challenge, at Michigan, against Maryland and at Texas. Brutal! 25. UCF (27): The best news for the Knights was Tacko Fall leading them in scoring (20) and boards (nine) in a win over Northern Kentucky. If Fall can be a dominant player on most nights, then UCF will win the AAC. Alabama and at Missouri are the next two on the docket to test this club. 26. Arkansas (NR): This is called a do-over. 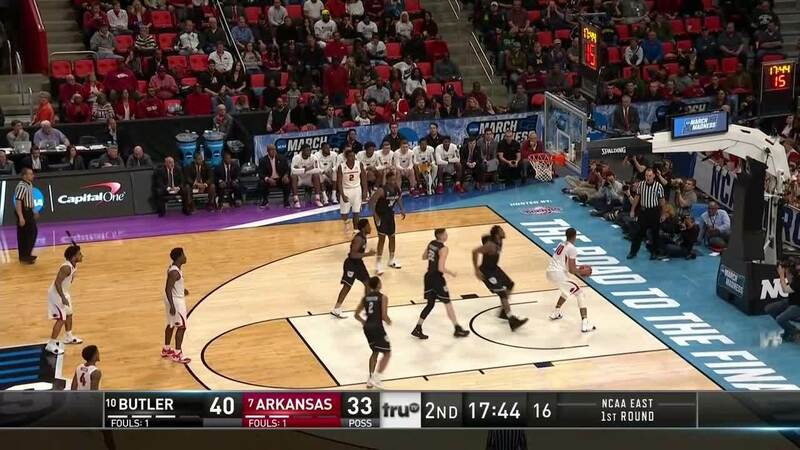 Arkansas probably should have been in last week’s Power 36 after beating Indiana a week ago Sunday and losing to Texas in overtime in the opener. The Hogs didn’t have a marquee game last week but they do have an absolute star in Daniel Gafford, averaging 19 and eight so far this season. 27. Creighton (NR): The Bluejays have made quite a comeback after losing at home to what is clearly now a solid Ohio State team. Creighton, which was supposed to be in a bridge year, won a tournament in Grand Cayman with wins over Boise State, Georgia State and No. 16 Clemson. Guard Ty-Shon Alexander is the latest standout for the Bluejays, averaging 19.2 a game. 28. Indiana (18): Yes, the Hoosiers are one bucket away from being undefeated. And the loss was at Arkansas, but Indiana didn’t play well against UC Davis — trailing by a deuce at the half. Juwan Morgan scored 31 in the comeback win. Indiana will get a monster exam at Duke this week before opening the Big Ten against Northwestern and at Penn State. 29. Nebraska (14): The Huskers were my pick to finish in the top two in the Big Ten. It can still happen, but to say the performance against the Red Raiders was a disappointment is an understatement. The Red Raiders ran the Huskers out of the arena, 70-52. The win over Seton Hall could have some shelf life come March if the Pirates continue to improve. But this week will be telling with games at Clemson for the ACC-Big Ten Challenge Monday and opening the Big Ten against Illinois and at Minnesota before the rival game against Creighton. 30. Houston (36): The Cougars passed their first test of the season with a convincing road win at BYU. Oregon is the second roadblock to hurdle this weekend. This team will continue to grow on everyone as it makes a case for the top spot in the AAC. 31. Arizona State (NR): The Sun Devils are back to being a non-conference terror. ASU knocked off No. 15 Mississippi State and Utah State in Las Vegas, the latter behind Luguentz Dort’s 33 points. Games against Nevada, at Georgia, at Vanderbilt and a showdown with Kansas all are up ahead in December. We’ll know then if the Sun Devils are a true Pac-12 title contender. 32. St. John’s (33): The Red Storm won the Legends Classic in Brooklyn by beating Cal and VCU. Shamorie Ponds scored 32 and 35 in the two games and LJ Figueroa was corralling boards during the wins. St. John’s is looking more and more like a top-three Big East team. 33. Oregon (28): The Ducks did nothing wrong last week but the drop was more about other team’s more impressive weeks. Bol Bol is leading the Ducks in scoring and rebounding of late and that makes Oregon a good watch on any given night. 34. Furman (34): The Paladins held their spot in the Power 36 as they moved to 7-0. The margin of error is always thin for teams out of the Southern and Furman still has one more major game at LSU in late December. 35. Clemson (23): Clemson dropped in the Power 36 after losing its first showdown game to Creighton in the final in Grand Cayman. The Tigers will have plenty of opportunities to shoot back up the rankings, beginning with Nebraska Monday in the ACC-Big Ten Challenge. 36. Maryland (NR): I fell for the Terps when I saw them beat Mount Saint Mary’s. But I wanted to see how they would handle Marshall. Well, Maryland crushed the Herd behind Anthony Cowan Jr.’s 26. The schedule gets rough with Virginia in the ACC-Big Ten Challenge before hosting Penn State and going to Purdue. Gonzaga: The Zags looked every bit a Final Four team in the Maui Invitational win. This team has guard play, scoring off the dribble, shooting and can compete on the boards with the best in the country. Once Killian Tillie gets back for the stretch run, the Zags may be the favorite to win the title, not just one of the contenders. Gonzaga took out Illinois, Arizona and Duke en route to the championship in Maui. Luguentz Dort, Fr., G, Arizona State: Dort put on a show in Las Vegas, scoring 17 in the win over No. 15 Mississippi State and then 33 against Utah State. He made 16 of 35 shots, 5 of 8 on 3s, 13 of 18 free throws, grabbed 16 boards, dished out six assists, four steals and nine turnovers. Dort started the season with 25 in a win over McNeese and 12 against Long Beach State. So, this is nothing new for the ASU stud. Coby White, Fr., G, North Carolina: Scored 33 in a loss to Texas and 19 in a win over UCLA in Las Vegas. Star. Kerwin Roach II, Sr, G, Texas: Poured in 32 in the upset win over North Carolina and then 15 in a loss to Michigan State in Las Vegas. He doesn’t back down from anything. Stud. Josh Langford, Jr., G, Michigan State: Langford was a completely different player in the second half against Texas, scoring all 29 points. He’s leading the Spartans in scoring and is all in on being the leader with Cassius Winston and Nick Ward the Spartans need to chase the title. Antoine Davis, Fr., G, Detroit: Mike Davis’ son is leading the Titans with 30 points a game, scoring 42 against Loyola (Md. ), 32 against Bowling Green and 24 at Eastern Michigan. All three of those led to wins for the Titans in Davis’ first season in Detroit. Davis committed to Houston, but then changed to play for Texas Southern before coming with his father to Detroit when he got the gig last spring. Shamorie Ponds, Jr., G, St. John’s: Ponds, the preseason pick for Big East player of the year, looked the part in leading the Red Storm to the Legends Classic title with a combined 67 points against Cal and VCU in Brooklyn. He got to the line 15 times and made 11 in the overtime win over VCU. He had seven steals and only one turnover to go with his seven assists. Creighton over Clemson in the Cayman Islands: The tournament title is a huge confidence boost for the Bluejays. But the win was also critical for the Big East. The league desperately needed more non-conference wins against potential NCAA tournament teams. The A-10: The league already has 41 losses, including 12 at home. The league has just one road win — Saint Louis at Seton Hall. The good news is a bottom dweller like Fordham is 5-1, but the bad news is that potential title teams URI (2-2), Saint Joseph’s (3-3) and George Mason (2-5) haven’t gotten off to strong starts. My pick Davidson is still looking strong at 5-1. But the league needs a much better December before it settles into conference play. Lipscomb: The Bisons beat No. 18 TCU 73-64 and are off to a 5-1 start with the only loss coming against rival Belmont. Vanderbilt: The Commodores lost their star freshman point guard Darius Garland with a torn meniscus for the foreseeable future. The Commodores lost to Kent State, 77-75, after Garland got hurt. Vandy plays NC State, Middle Tennessee State, Arizona State and Kansas State over the next month.